Struggling to conceive – hit the gym and carry on! Kate from Cambridgeshire remembers clearly the years of heartbreak and disappointment at being unable to get pregnant – as many of her friends completed their families. “I met my husband Nick when we were still teenagers and we both knew that we wanted children one day,” she says. “A few years later we got to a stage when we were secure and settled with a house and running our own businesses and decided the time was right to start a family. “We didn’t know how long it would take to conceive because you don’t know until you start trying and so it was the unknown. Kate is a keen advocate of regular exercise and mindfulness. A regular gym-goer, she feels sure that this helped to take her mind of things and keep her positive when she couldn’t get pregnant. “I just focused on keeping myself fit and active,” she says. Only a small number of people require IVF and there are many ways that natural fertility can be boosted and other assisted conception treatments can be offered at Bourn Hall’s fertility clinics. Bourn Hall Clinic in Cambridge is offering free consultations with a fertility nurse specialist until the end of the year. Advice will be given on a range of measures that can be used to help people become parents. According to the Human Fertilisation & Embryology Authority over 90 per cent of couples conceive naturally within two years. If you haven’t conceived for a year, however, or you know you have a condition which affects your fertility, you should go and see your GP to discuss next steps. After a further two years the couple went back to their GP who referred them for further hospital tests. They were told that they had ‘unexplained infertility’ which is the reason given when tests can detect no underlying. 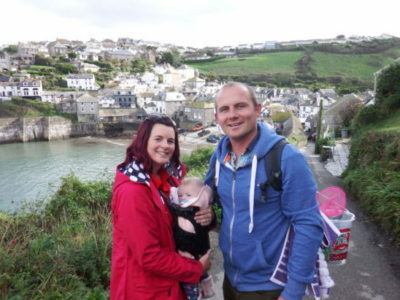 Kate and Nick were told that they were eligible at that time for one cycle of NHS-funded treatment and were referred for fertility treatment. Kate and Nick chose to have their fertility treatment at Bourn Hall Clinic which was only a 15 minute drive from home. “Bourn Hall is one of the best in the country and is literally on our doorstep,” says Kate. Kate and Nick had their IVF treatment in September 2016 and were delighted when it worked first time. “The first scan when we saw our baby’s heartbeat was just amazing, I burst in to tears,” remembers Kate. Kate carried on going to the gym throughout her pregnancy and also went to pregnancy yoga which she found really helpful to focus on her breathing. Daughter Amber was born in May this year and Kate and Nick are besotted with her. “Motherhood is everything I hoped it would be,” reveals Kate. To find out about Bourn Hall’s Fertility health + wellbeing tests click here.